California is a great state for motorcycling recreationally and practical commuting. But riding a motorcycle can also be a dangerous way to travel for a few reasons, and the dangers are highlighted by the fact that biker fatalities and collisions in California increased significantly in 2014. The California Highway Patrol and California Office of Traffic Safety issued a press release recently saying there were 862,705 registered motorcycles in the state, and more than 1.4 million people licensed to operate motorcycles. In summer, the number of bikers on the road increases over other times of the year, so CHP urges caution for all involved. The press release says it is up to both motorcycle riders and passenger-vehicle drivers to keep the roads safe for vulnerable bikers. From 2013 to 2014, there was an 11 percent increase in California motorcycle fatalities, from 475 to 527. Overall, there was a 4 percent increase in collisions. The collision rate is cause for concern too because when a motorcycle and another vehicle crash, the biker often comes away with serious injuries. And people in passenger vehicles too can be injured in such collisions. 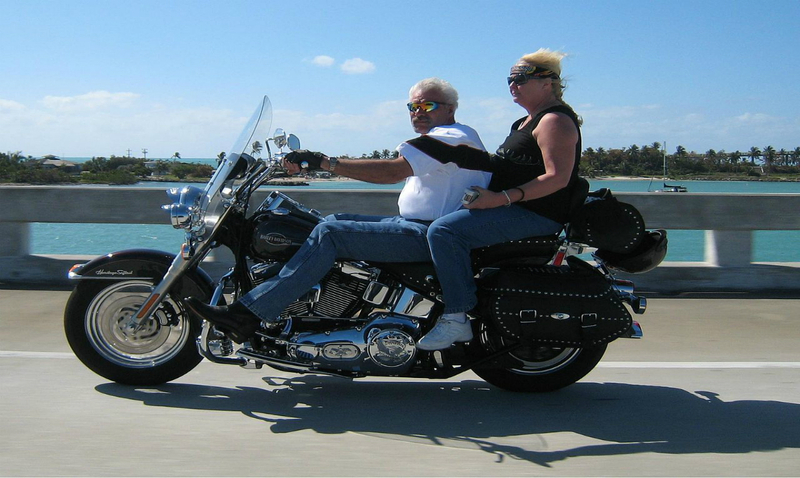 The National Motorcycle Institute reports that bikers are 26 times more likely to be killed than passenger vehicle occupants on a mile per mile basis. The reason is that motorcycles are less stable than vehicles with four wheels and do not have a protective shell like passenger vehicles. Motorcycles are also harder to see because they’re smaller. So it is vitally important that both motorcyclists and other motorists be hyper vigilant with respect to motorcycle safety. The California Highway Patrol offers a program called the California Motorcyclist Safety Program, with courses for beginners and experienced riders. Since its inception in 1987, the program had graduated 1 million participants through late 2015. The Motorcyclist Training Course is a 15-hour course both in the classroom and on the road that is mandatory for all riders under 21. The CHP recommends all riders take this course, even those over age 21. There are more than 120 training sites in the state. Learn more or register here for the course, which gives practical motorcycle training and aims to keep bikers safe. One piece of advice that can’t be emphasized enough is that you should not drink and drive any vehicle, let alone a motorcycle. The National Motorcycle Institute reports that in 2014, motorcycle riders had the highest incidence of alcohol-impairment than any other vehicle type—29 percent, as compared to 22 percent for passenger cars and light trucks and 2 percent for large trucks. What if I’m to Blame? If you’re a motorist who’s been in an accident, consider hiring an attorney to help you get compensation for injuries, medical bills, lost wages and pain and suffering. You can recover partial compensation even if you were cited for a traffic violation if the other driver contributed partial fault to the accident. California is a comparative negligence state. That means that if one driver was 70 percent responsible for causing the accident, he can still recover up to 30 percent of the monetary damages. Of course your cause would be stronger if you were not cited and the other driver was. But don’t let that stop you from trying to recover monetary damages, especially if you have serious injuries. Negligence is a legal term that applies in civil cases as opposed to criminal cases. Because the person who was at fault in an accident did not intentionally cause harm, he is said to be negligent, which means he failed to exercise the care that a prudent person would. But there is another category of fault in civil cases involving traffic accidents—recklessness, or a clear disregard for the safety of others. Motorists who speed, drive drunk or drugged, tailgate or swerve dangerously can all be deemed reckless drivers. If you do get in an accident because of someone’s negligence, follow the advice that Krasney Law laid out in this blog. We also published a blot titled 7 Tips on How to Ride More Safely on a Motorcycle. Krasney Law in firm attorneys, serving clients in San Diego and all of California, are experts in personal injury and motorcycle accident law and can help you deal with insurance companies so you get the maximum compensation in your settlement. Or we can help you file a lawsuit or other legal action if we deem it necessary. Contact your motorcycle-accident attorneys at Krasney Law, (909) 380-7200. We will charge you nothing for an initial consultation, and we may arrange payment on a contingency basis. That is, we don’t get paid unless you accept a settlement or we go to trial.